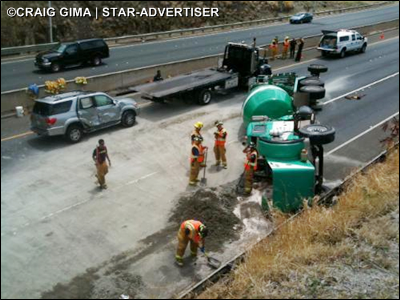 I'm glad that I wasn't following behind when this concrete truck tipped over on the freeway today dumping its load of ready mix. The sight of fresh concrete is always nostalgic to me from working in the construction trade. The sight, I say. Troweling the concrete is a totally different fun thing altogether. I sincerely feel for the firefighters shoveling the concrete off the freeway. After a few shovelfuls things tend to get heavier and that's no matter whether the slump is liquidy or on the dry side. Plus, they have to do it before the the concrete starts to set up while the asphalt temperature hovers near 100 degrees. Obviously, this is not the kind of work the firefighters originally signed up for. Asides from concrete spills, I'm seeing a few paint spills left on the roadways around town from contractors that neglected to clean up their masterpieces. Oh my goodness!! Was the driver going too fast or turning too fast? Talk about a Make A moment, yeah? I hope he's okay! Those poor guys having to clean it up! Mokihana- the driver was unscathed enough to claim mechanical failure, but these concrete drivers are always barreling on the freeway. Plus this particular concrete truck was towing a concrete bin so it might have fish tailed from a higher than recommended speed. There's a slight S-curve with an uphill grade at that point on the freeway headed Kaimuki near University Ave. Wait til the company gets the cleanup bill. I don't even think that it can be cleaned up well. The stain will still be there for 20 years. I'm not supposed to be at the computer too much, but I just had to see what you were up to. You been up to a lot! That cement accident looks terrible. Since my son was a firefighter, I especially feel for those guys. I can imagine how awful it must be to be doing that work in the hot sun. Kay- oh yeah, working that close to the asphalt with no shade. No, the firefighters shouldn't be doing this type of cleanup. I've seen them rescuing a cat up high up on a limb. But suppose they get back to the station, and have to respond to an emergency after getting tired like this. Ridiculous. As a biker I always look for loose stuff in trucks. The other day scootering over the Pali I saw a guy with a kayak on his roof held by one piece of STRING! Got away from behind him QUICK! You went over the pali on a scooter?! That's insane. I know it's legal but still. And I know what you mean about those things on the surf racks. Never followed behind a kayak on top, but with stacks of surfboards, like six, and I noticed that the pile was at a slight angled to direction of travel. Freak, couldn't get pass them soon enough. The bozos. The Hobron area in the proximity of the Eaton Square, Smoke House is nice, but Kaioo Dr. is a mix of seedy and luxury apartments from passing by there. Probably telling you what you already know. It's just that a lot of apartments don't allow pets. Then you gotta get one with parking, whew. About 2 years ago, rent was astronomical, $200-400 what the rentals were worth, and I guess people were hard up or they were just looking for another option. I "think" the rent might have dropped so it's a better period to find an apartment on land. No way people could go on paying the rates. A lot of public assistance started populating Waikiki town. Some legit intermixed with the usual cast of characters. It was in the newspaper about a year, 2-years ago, that Hawaii or Honolulu (?) has the highest rents in the nation based on renter's income.